Chinook (king) salmon have been returning in fewer numbers to many Alaska rivers, requiring painful restrictions on fisheries that harvest these stocks. Widespread shortfalls first became apparent beginning in 2007. Chinook salmon have a life span of 3 to 8 years, with 5 and 6 year olds being especially important to the reproductive health of a Chinook salmon population. In October of 2012, the Alaska Department of Fish and Game hosted a research symposium to "identify key knowledge gaps and assemble a list of research priorities" to better understand the factors affecting Chinook salmon abundance in Alaska. Following this symposium, a team of department scientists and biologists, in collaboration with federal agencies and academic partners, developed a research plan with recommended studies to address the questions identified in the gap analysis. The first phase in the implementation of this plan was funded by the Alaska Legislature in 2013. The core of the plan is stock specific, life history-based research focused on 12 indicator stocks from across Alaska. 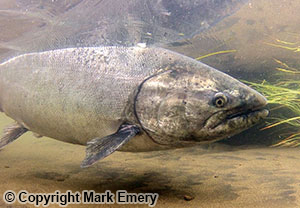 For more information see the Chinook Salmon Stock Assessment and Research Plan. Research efforts under this plan fall into four general categories. Stock assessment programs targeting specific knowledge gaps on individual, indicator stocks. Compilation of local and traditional knowledge regarding Chinook salmon trends in abundance, distribution, and physical appearance. Research on juvenile Chinook salmon in the near shore marine environment, which is thought to be a critical life history stage, and one little studied. Life history process studies intended to examine a range of environmental factors affecting Chinook salmon growth and productivity. The original plan was to allocate $30 million covering research over a five-year period. In response to this plan, the legislature appropriated $15 million to this effort in two separate appropriations and money was mostly allocated to adult and juvenile stock assessment studies, various subsistence studies, marine stock composition and harvest studies, the University of Alaska Fairbanks for ecological process studies, genetic stock composition and harvest studies, and programmatic support, in that order. Unfortunately, Alaska’s recent fiscal crisis has curtailed further appropriations causing the original $30 million plan to be revised to a $15 million plan. Ultimately, the initiative funded over three dozen specific research projects through this effort. The department recognizes the public has a keen interest in the results of this work and final publications will be available on this website in the near future. Reports will be posted as they become available. Please bookmark page so you can return to it easily to check for new information. How have low Chinook salmon runs affected Alaskans? Since 2007, Alaskans have suffered from the effects of low runs of Chinook salmon. Fishery closures and restrictions necessary for conservation resulted in great burdens on Alaskans who rely on Chinook salmon for food and income. The State of Alaska recognizes the hardships that management restrictions have caused subsistence, commercial, and sport fishermen, as well as guides, local fish processors, and other local and regional businesses. What areas of Alaska were affected by low Chinook runs? Chinook salmon runs across the state since 2007, for the most part, have been well below average. Implementation of strict fishery management actions have been necessary to meet escapement objectives, and many fisheries have been curtailed to protect Chinook salmon. In the Yukon and Kuskokwim Rivers, weak runs of Chinook salmon resulted in extensive restrictive management actions in the subsistence and commercial fisheries by the department. In 2016, runs improved for the Westward stocks (i.e., Yukon, Kuskokwim, and Nushagak) but overall these runs are still below the long-term average. Runs also improved in Kodiak and Cook Inlet in 2016, but still, compared to the long-term average, their overall runs are still below average. Unfortunately, Chinook salmon runs from the Copper River to southern Southeast Alaska took a turn for the worse and in 2016 the runs there were the lowest on record. Scientists expect runs to continue to improve in Kodiak, Cook Inlet, and Westward; however, the outlook in 2017 is not good for Southeast as very few "jacks," typically a strong indicator of future production, were seen in 2016. What is causing low runs of Chinook salmon in Alaska? Numerous physical and biological factors can influence production and survival of Chinook salmon in the freshwater and marine phases of their lifecycle. Research through this initiative suggests that most of the Chinook salmon mortality is occurring in the first few months of life at sea. Additional research is needed to gain a better understanding of the primary factors that are affecting Chinook productivity and abundance. Fluctuations in the survival of Chinook salmon smolt can significantly alter run strengths at local, regional, and statewide scales. For instance, the long-term marine survival for four Southeast stocks has been about four percent, meaning for every 100 smolt that emigrate to sea, four fish will return as adults over the next one to five years. Research has shown that during the period of poor production, marine survival has dipped below one percent. This decrease in marine survival, even in the face of some very good freshwater production in several systems, has resulted in a major downturn in overall adult production. The exact mechanisms behind the increased mortality rates are unknown, but environmental conditions such as precipitation, air and ocean temperatures and water currents, to name a few, are believed to affect juvenile salmon survival. What are the State of Alaska and Federal Governments doing to help affected Alaskans? In addition to the Chinook Salmon Research Initiative funds, in 2012 the State of Alaska requested fishery federal disaster determinations from the U.S. Secretary of Commerce for Chinook salmon fisheries on the Yukon and Kuskokwim Rivers, and Cook Inlet. In September 2012, the Secretary of Commerce, after reviewing information from the state, determined that a commercial fishery failure due to a fishery resource disaster exists for three regions of the Alaska Chinook salmon fishery. As a result, in 2014 Congress appropriated $20.8 million for fishery disaster relief under the Magnuson-Stevens Fisheries Management and Conservation Act. In 2014, $7.8 million of the appropriated funds went to Cook Inlet, Yukon, and Kuskokwim commercial salmon harvesters. In 2015, the National Oceanic and Atmospheric Administration distributed the remaining $13 million to a variety of sport and commercial users. Broken down further, $4.5 million went to the recreational fishing sector and related businesses for loss of income, $6.4 million for salmon research in the Yukon/Kuskokwim region, $1.1 million for salmon research in Cook Inlet, and $700,000 to salmon buyers in the Cook Inlet region.